Edition: Vol. in ASLA Centennial Reprint Series. Robert Morris Copeland (1830-1874) was one of a small number of American landscape practitioners whose written and built work helped establish the foundations for city planning and integrated park systems. As did his colleagues Frederick Law Olmsted and Horace Cleveland, Copeland merged many of the principles of scientific farming with landscape gardening. Although he died at a relatively young age, his accomplishments were substantial. He left behind several important designs for cemeteries, estates, suburbs, communities, and parks throughout New England, New York, and Pennsylvania. In 1859, Copeland published Country Life, which quickly became a bible of scientific farming and landscape gardening, as it incorporated the latest agricultural practices with new engineering methods. Handsomely illustrated with plates and woodcuts, the book sold through six editions. 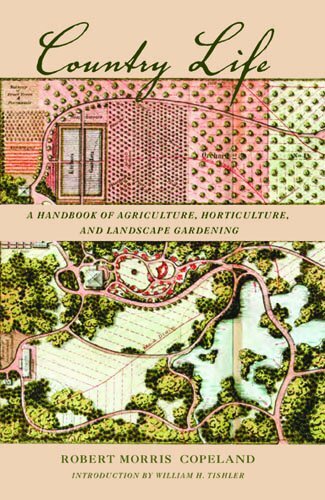 Copeland organized the book into an agricultural year that provided practical and aesthetic advice on a month-by-month basis, according to area. He dedicated the book ""to all lovers of nature and to all engaged in cultivating and adorning the earth,"" suggesting that a well-managed farm ""can expand the mind and ennoble the soul."" A new introduction by William H. Tishler analyzes the importance of the book to mid-nineteenth-century America and chronicles Copeland's other important achievements, including his early concept for a metropolitan park system for Boston that foreshadowed Charles Eliot's efforts by many years. Robert Morris Copeland (1830-1874) was an American lanscape pracititioner who published Country Life in 1859. WILLIAM H. TISHLER is professor emeritus of landscape architecture at the University of Wisconsin.